By day, a restaurant with tacos and burgers on the menu, as well as a variety of drinks made with their own brand of tequila. By night, becomes more of a bar feel, with a DJ on weekends. 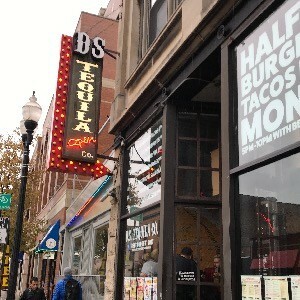 In recent years, has become a location with more lesbians than other Boystown establishments (although still mostly guys). Patio is open year-round, is covered and heated in the winter. Join us for our Saturday night party! Featuring a rotating cast of Chicago's top DJs spinning current hits and club classics. Coat check available in the winter months. $3 Jell-O shots, $5 Tito's mixed drinks. DJs start at 11.